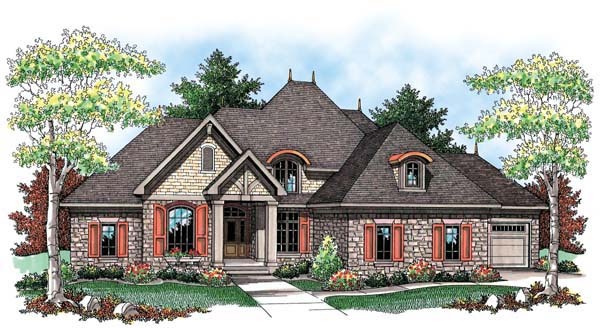 This European inspired design includes many amenities that will make you fall in love with this home at every turn. A soaring two-story ceiling highlights a elegant curved staircase as you enter the home. To your right, arches supported by graceful columns define the formal dining room, while to your left, double French doors open to a sophisticated den. Sunlight streaming through a wall of windows in the great room directly ahead draw you in where you’ll love the high step ceiling and central fireplace flanked by built-in cabinets. The kitchen, nook and hearth room all blend easily together to create a daily living area to the right of the great room. The master suite lies to the left of the home and includes a step ceiling, whirlpool tub and spacious walk-in closet. Upstairs you’ll discover two bedrooms that share a Jack and Jill bathroom, and a third bedroom with private bath; all three bedrooms have a walk-in closet. 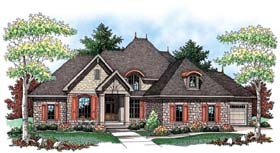 The home is completed by a four-stall, split load garage.